To foster the social economic and environmental welfare of the Chorleywood Parish and to contribute to a sustainable and an inclusive community. Chorleywood has 17 elected Councillors representing five wards who sit on four committees: Open Spaces; Village Halls; Planning; and Policy and Resources. Councillors can be contacted here. The calendar of meetings shows when the Parish Council Committee meetings are held. You can also access the agendas and minutes for all meetings via the main menu. The Parish Council considers all planning applications within Chorleywood. You can view Plans & Comments by clicking on this link. Notice is hereby given that two (2) casual vacancies exists in the Office of Parish Councillor for the Parish of Chorleywood representing residents in Chorleywood North. The reason of resignations is due to personal circumstances. The Council will fill these vacancies by co-option at their meeting scheduled for Tuesday 25th June 2019 and request that interested parties apply in writing using the application form to the Clerk to the Council by Friday 21st June 2019. The Annual Parish Meeting will be held on Tuesday 16th April 2019 in the Common Room at the War Memorial Hall, Common Road, Chorleywood, Herts, WD3 5LN. This will be followed by a Full Council Meeting. The Press and Public are cordially invited to attend. During the course of the day on Friday 22nd February 2019. Police received some reports of Door-to-Door sellers in the local area of Chorleywood. Police attended the area, however they were not located at the time. Always check to see who is knocking on your door by using a ‘door viewer’ or by looking out your window. Do not open your door to any unknown persons or call out to the person to identify themselves before you decide to open your door. Identification and Licenses can be requested to be posted through the letterbox. Please contact the Non-Emergency number 101 should you have any further similar incidents. Also I have left a link below on the law regarding door-to-door sellers for your information. Chorleywood Post Office has been closed for some time following a break in. The Parish Council are now able to advise that the Post Office in its current location will re-open, however this is not likely to happen in the near future, as there was substantial damage caused internally, which needs to be repaired. The Insurance Company are currently dealing with this. It is also known that the owner of the post office, wishes to redevelop the site into flats, which would result in the loss of the post office. The Parish Council now can advise that the Co-Op are looking at the possibility of having post office services within their shop, following their refurbishment. In the interim they have applied to head office to have an ATM housed within their premises in order that residents can at least get cash. This is not an ideal situation in the short term but, please be assured that as a statutory body the Parish Council will do everything in its power to ensure that a post office service remains in Chorleywood and careful negotiations are now taking place with Post Office Ltd. Issued by Chorleywood Parish Council on 8th February 2019. TRDC are currently consulting on a Call for Sites across the district. 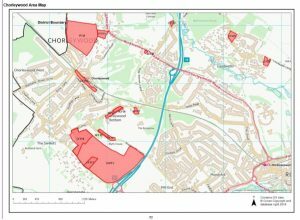 A number of sites have been identified within Chorleywood and it is recognised that some development of the area will take place within Chorleywood over the next ten years or so. Have your say on how you wish Chorleywood to look in the future and comment on the 14 proposed Neighbourhood Planning Policies. Three Rivers District Council is preparing a new Local Plan that will set out a vision and framework for the future levels of growth within the District for the next 15 years until 2036. The Potential Sites Document contains sites that were put forward for consideration in the previous Local Plan process and were not allocated for development and those put forward by landowners, agents and developers as part of the Call for Sites consultations undertaken in 2017 and 2018. The Potential Sites Consultation is an additional non-statutory consultation, providing the opportunity for stakeholders to comment on potential sites which will feed into the Strategic Housing and Employment Land Availability Assessment (SHELAA) process. The SHELAA is an assessment which identifies sites and broad locations with potential for development. It assesses their development potential, suitability for development and the likelihood of development coming forward. It is important to note that at this stage no decisions have yet been made on specific sites. The Potential Sites Consultation Document and accompanying Sustainability Appraisal Working Note can be viewed on the Council’s website at: www.threerivers.gov.uk/egcl-page/new-local-plan. Hard copies can also be viewed in the Council’s offices in Rickmansworth (address below), the public libraries located within the District (Abbots Langley, Chorleywood, Croxley Green, Oxhey and Rickmansworth) and at the Parish/Town Councils’ offices. By post to: Economic & Sustainable Development, Three Rivers District Council, Three Rivers House, Northway, Rickmansworth, Herts, WD3 1RL. Although the initial consultation period has now closed, the above links to relevant documents are still available. 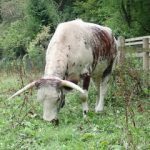 On 8th October the 4 longhorn cattle left the Common after having a very successful 6 weeks of grazing down in the Maybushes. As you will be able to see, they have had a big impact on the scrub levels and hopefully, come the spring, their efforts will be realised by an increase in wildflower species. We look forward to their return in 2019. Advertised by Friends of Chorleywood Common but open to everyone. Last Thursday of every month 10.00am – 12.30pm, ending at a pub where people can stay for lunch/a drink if they wish. Certain tasks may take longer and will be advertised as such in advance. Other special walks and events can be added in ad hoc – i.e. bat walks, wild flower walks etc. Click here for further details.